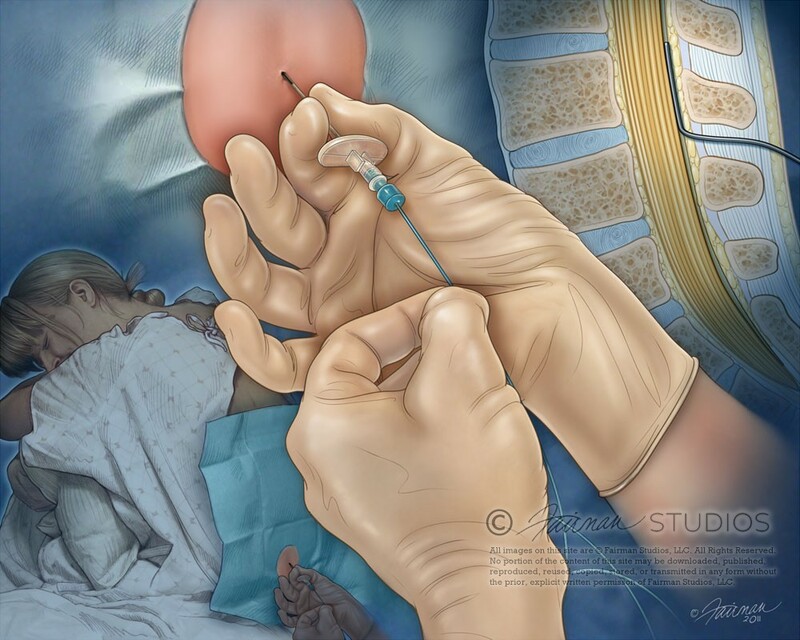 This illustration is one of the latest editorial pieces completed for the American Academy of Family Physicians featuring Labor Analgesia. Depicted are a montage of images illustrating Epidural analgesia, a commonly employed technique which provides pain relief during labor. Epidural analgesia is a form of regional analgesia involving injection of drugs through a catheter placed into the epidural space. The injection can cause both a loss of sensation (anaesthesia) and a loss of pain (analgesia), by blocking the transmission of signals through nerves in or near the spinal cord. The epidural space is the space inside the bony spinal canal but outside the membrane called the dura mater (sometimes called the “dura”). In contact with the inner surface of the dura is another membrane called the arachnoid mater (“arachnoid”). The arachnoid encompasses the cerebrospinal fluid that surrounds the spinal cord.